Miss Murray Lambert was the original owner of the Stradivarius, and she was one of the few women of the inter-war years between 1920s and 1930s to pursue a career as a concert violinist. After her death, her violin was auctioned, and was purchased by Seymour Solomon for £17,500. 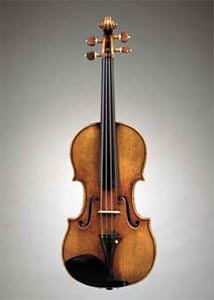 The Solomon Ex-Lambert Stradivarius is unique and special as it is one of the violins made during Stradivarius’ mature period, the years when most of his best instruments were made. In 2007, British violinist Ruth Palmer performed with the Solomon Ex-Lambert at the press launch for the auction held at Christie’s, one of the worlds’ leading dealer in the art business. The Solomon Ex-Lambert Stradivarius was then sold at a price of £1.38 million, or US$2.728 million at the year of exchange rate. Though it fetched a million-dollar price tag, Solomon Ex-Lambert did not overcome the then-world record price of US$3.544 million set by “The Hammer” in a 2006 auction.